Today’s Book Club was filled with laughter and a little bit of mayhem, perfect for the subject of our discussion. 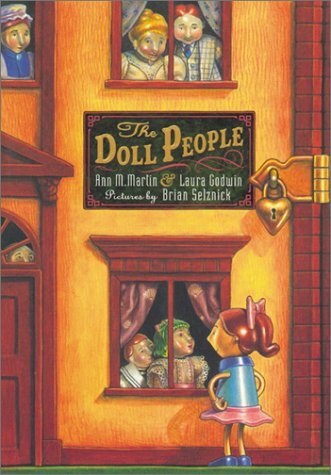 The Doll People, by Ann M. Martin and Laura Godwin, was a hit with our members. The adventures of Annabelle Doll, her family, and her new neighbors made for an entertaining read and lively meeting. Everyone appreciated the themes of friendship and testing your comfort limits. Annabelle was able to stop being so bored and restless when she challenged her daily existence and opened her heart to an exciting, yet very different, new friend. And all of the Doll family were able to overcome their fear of the unknown in both their quest for Auntie Sarah and their acceptance of their new (both figurative and literal) neighbors. We had a fun discussion of whether or not our dolls/toys/stuffed animals are real or not. The general opinion is that, yes, indeed, our beloved playthings do come to life while we sleep. So, next time you put down a toy, check to make sure that it’s in the same place the next time you go to play with it. Odds are, it might have had an adventure without you! Our next Book Club meeting will be held Thursday, March 3rd from 4:00 p.m. to 5:00 p.m. Please note the change in time.